How do I register on ipsrjobs.com? Click on register now link, it will take you to application form. Fill out all details, upload your resume and submit. What is Ipsr registration number? 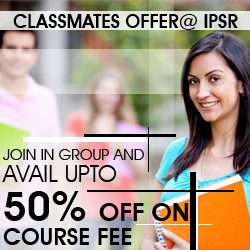 Ipsr registration number is the unique registration number for students who have undergone training from Ipsr. For non Ipsr students leave space as blank. Resume is mandatory. When you apply for a job, your resume will be going to the company. If you don’t upload resume your application will not be received at the company. Yes, further communication from companies might be through emails. So you need an email id to register your profile. Only Ipsrjobs administrator has the access to your profile and resume. How do I obtain a list of job openings? How do I know if this job is still available? You can apply only for active jobs. If the job is not available, then apply now button will be displaying expired. Your application will be directly going to companies, if you get shortlisted companies will directly contact you for further rounds. HR from the companies will take your contact details from your resume and directly call you. Make sure contact details in your resume is up to date to get interview calls. How do I apply for a Recruitment Drive at ipsrjobs.com? How do I apply for a Vacancy at ipsrjobs.com? Do I need to create my profile every time? No, once you create your profile, you can apply directly by login to your profile. Do I need to update my profile frequently? Yes, your profile need to be up to date. Yes you can apply for all the jobs matching your profile. Can I apply again for the same job posting? You can check latest recruitment drives and latest vacancies, search option based on technology also available. Last date of application is given in each vacancy details page. You need to apply before last date. I am not registered on the site. Can I still apply? For Recruitment Drives, Confirmation mail will be sent to your email id within 48 hours if the hall ticket is mandatory for the drive. Click on confirmation link in your confirmation mail to get your hall ticket. For Vacancies, your resumes will be directly going to companies. If you get shortlisted companies will contact you for further rounds. Your application will be directly going to the companies. If you get shortlisted companies will contact you directly for next rounds. Time duration for response may vary for different companies based on number of applications received. What is preliminary screening test? Preliminary screening test is an online test designed to screen candidates based on their knowledge in technologies. Companies prefer to get candidates with good technical knowledge. For selected recruitment drives hall ticket will be issued based on your score in screening test. Why should I attend this test? If the preliminary test is given as mandatory for a particular recruitment drive or vacancy, then only candidates scoring good marks will be allowed to attend drive. How can I get Hall ticket? From where do I download hall ticket? Once you confirm your participation, hall ticket will be directly opened in a new window. Is hall ticket mandatory for all recruitment drives? If hall ticket mandatory, it will be given in site. Go through all instructions before proceed. I couldn’t confirm drive, can I attend drive? Only confirmed candidates receive hall ticket. If hall ticket is mandatory for the drive and you couldn’t confirm before time, you will be able to attend drive. I haven’t got hall ticket, why? Either you are not meeting the eligibility criteria of the company or your profile is missing some information like percentage of marks, degree, college name etc. What will happen if I couldn’t attend interview after confirming my participation? If you are not able to attend drive, inform us before the event through mail or call. Otherwise your profile will be blocked from applying future vacancies and recruitment drives. How do I create an effective job alert? You can unsubscribe your email id from our newsletter database. Why do I get jobs that aren't exact matches? You might have chosen categories wrongly. Subscribe Newsletter by submitting your email id at Subscribe Newsletter window at the right bottom footer. What is the help line number of ipsrjobs? 9446922478. Call us between 9:00 AM and 5:00 PM for urgent matters only. Job posting is absolutely free. How long does a job post remain on the site? Job posting will be active for a period of minimum one week, can be extended based on request. Can I post a job fair? I have three positions to fill, can I put all three in one job post? You can either post it as three vacancies or you can mention all vacancy details in a single post. How long it will take to get the response? Is there any limitations for number of postings? No you can post any number of vacancies.